The sweet spicy fragrance that hits you upon entering the Orchid Display House comes from this plant, an unnamed Lycomormium species. It is a complex fragrance. To my uneducated nose, it's nutmeg and camphor. An unconventional pairing to me, but appealing to male Euglossine bees, who as pollinators, are entitled to their preferences. All of the Lycomormium species in our collection are hefty plants when mature, with long (3 ft.) accordion-pleated leaves. 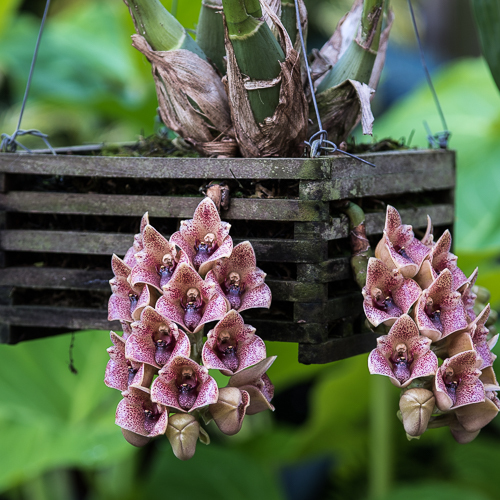 Like Stanhopea and Acineta, two other members of the orchid subtribe Stanhopeinae, Lycomormium species produce pendant spikes that grow down through the substrate, so we grow our plants in slatted baskets to allow the spikes to emerge. 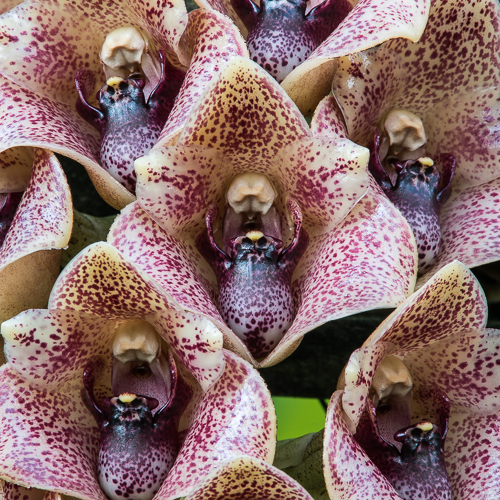 So, what's up with the name Lycomormium? Lykos (wolf) and mormo (ghost) is an intriguing combination. 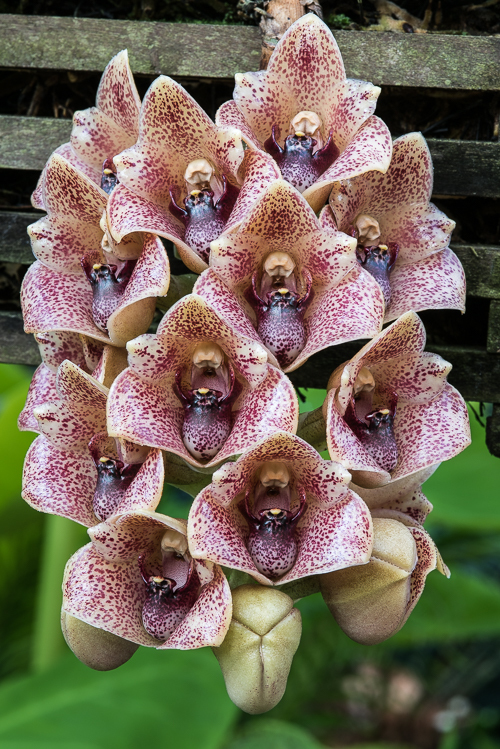 Pedro Ortiz, in 'Orchids of Colombia', says that when seen from the front, the column appears to have a pair of teeth projecting from under the anther, giving it the look of a wolf's head. Reichenbach, who named this genus, must have been looking at a type specimen of L. squalidum with more impressive teeth than our species possesses. If you're not a Euglossine bee, a Lycomormium can be a right pain to pollinate -like trying to stuff a fat pair of rabbit's ears into a mail slot. It seems to be easier if the flower has been without its anther cap for a day. We grow our plants in a mixture of long-fibered sphagnum and chopped coarse tree fern fiber. 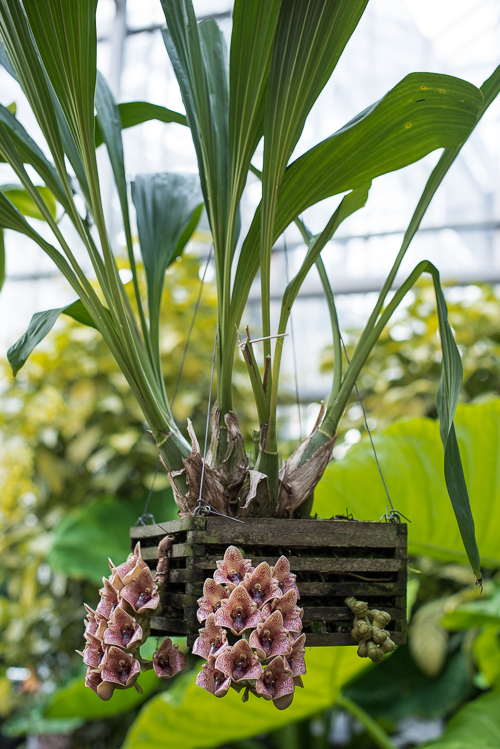 A couple of years ago we relocated our Lycomormium baskets to a brighter cooler location next to the wet wall in our back up greenhouses, with good results -stronger plants and more inflorescences.